This member of the Euphorbiaceae family was described by Leslie Charles Leach in 1973. 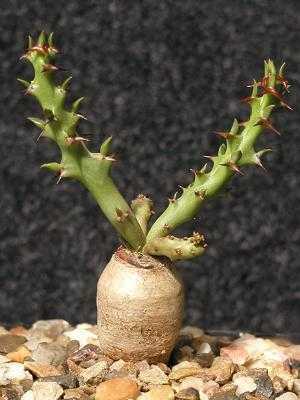 It is found in Zaire and Zambia, growing in a well drained soul with some water and some sun. The root can grow to eight centimetres in diameter, the branches up to fifteen centimetres long. The flowers are yellow.